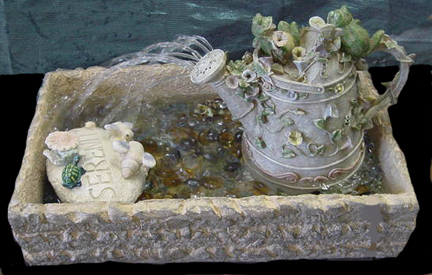 During the spring of 2002, Advanced Art students had the option to design and build a tabletop fountain after they had completed a required relief sculpture project in class. Studio space and some construction materials were furnished, but students were responsible for purchasing fountain supplies (such as pumps, foggers, underwater lights, etc.) and accessories. 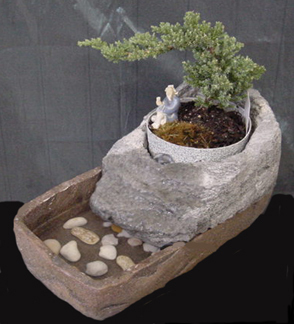 They could design and build whatever type of fountain they wanted, and while some students chose to simply assemble the various components, others had to build up platforms to serve as pump covers, spray paint bowls to resemble stone, or actually carve stone! Regardless of the type of fountain that the students created, they enjoyed having the opportunity to create something unique for themselves or for someone else!